I spent most of this week in Austin, Texas, where I was invited to participate in a panel on Wikileaks organized by The Guardian at the South By SouthWest Interactive festival. I had a great time there — it's a geeky festival I had long wanted to go to, with also great film and music festivals — although I'm still suffering from the brutal 20-hour trip. SXSW is largely about issues related to the technologies and content that deliver the internet, especially emerging new services, which can often pick up VC funding there or simply publicize themselves. But it's more than just a trade show, it's also a celebration of technology and the way it impacts humans and empowers them. Even if it's a little disconcerting to see so many people walking around in their hip T-shirts, arm out in front them, elbow bent, fingers rapidly shooting off messages on their iPhones, Androids and Blackberries: perhaps technology is not so liberating, although I'm hardly one to talk. It was great to attend some of the more techie talks there, notably seeing the great web design guru Jeffrey Zeldman in person. I also attended a great panel with Global Voices Middle East contributor Jillian York and CPJ internet advocacy coordinator Danny O'Brien, among others, on human rights and the web. The session ended up being dominated by an argument with another panelist, Ebele Okobi-Harris, who heads Yahoo's Business and Human Rights Department. I and others took her to task on what happened to Flickr's decision to take off pictures of Egyptian State Security officers that Hossam el-Hamalawy had put up after the raid on SS HQ in Cairo. Okobi-Harris indicated that the issue might have been handled differently had she been consulted, and that the pictures were flagged by other Flickr users and in breach of Flickr's policy that you have to post your own pictures. I found her argument thoroughly unconvincing (plenty of Flickr users post pictures that are not theirs, and besides Hossam never claimed that these were and the issue at stake was not ownership or copyright but public interest) and told her so, but it looks like Flickr won't budge. I was also taken aback that she basically recommended not to use Flickr for these things (even though we pay for the service) — and Hossam is now using Picasa to host those pics. Not good business, Flickr. That's me on the left end. My own panel has some great personalities: Ian Katz, deputy editor of the Guardian (the editor, Alan Rusbridger, was supposed to come but had to handle the capture and subsequent release of Ghaith Abul Ahad in Libya), who was the paper's key negotiator with Julian Assange before they ended their relationship; Sarah Ellison of Vanity Fair, who profiled Assange; Steven Engelberg of Pro Publica, the great transparency and investigative journalism outfit; and Carne Ross of Independent Diplomat, the UK diplomat who famously resigned in 2004 over Iraq. The talk, which you can listen to here, took on a lot of issues ranging from journalism's relationship with Wikileaks, whether Assange considers himself a journalist, what Wikileaks means for traditional diplomacy and whether (as Ross notably insisted) diplomacy needs to be more transparent and accountable. I weighed in on the Middle East angle, from what impact Wikileaks may have had on the Arab uprisings to the Arab media's treatment of the issues. Austin is an island of blue in Texas' sea of red: it's a hip, cosmopolitan liberal college town with great Mexican food and all kinds of fusion cuisine, microbrews and other accoutrements of cosmopolitan urban living, and hick country is just outside and the very values-centered TV show Friday Night Lights is filmed just outside. I had only time for two notable dinners: one in which I shared an unbelievably large and tasty steak with Andy Carvin, who was the it thing of SXSW as far as the media types was concerned for his gargantuan effort at tweeting the Arab uprisings. What Carvin did was not just RT information, but fact-check it and crowd-source it. It is perhaps the best model seen so far to use Twitter as a journalistic tool, despite its natural tendency to be used to spread unconfirmed reports and even disinformation. I also spent a night drinking and eating Austin's specialty trailer food with a great crowd of Arabist readers — all super-interesting, talented people (and some amazing Arabists, in the linguistic sense, among them). It's an honor to have such a smart readership, and it made me realize that I should meet with readers more often. The feedback I get on the site is invaluable. 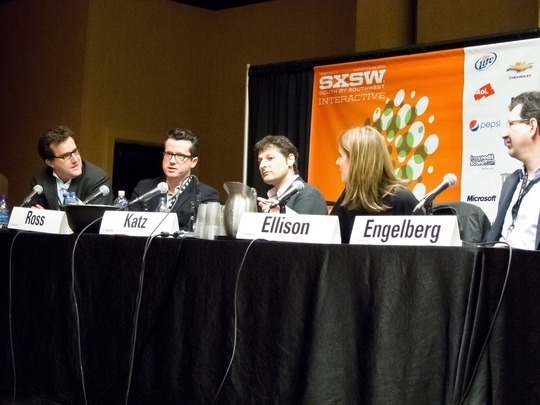 One of the big issues being discussed at SXSW was the future of the mainstream media, notably newspapers. In part this was because the film festival featured the excellent documentary on the NYT by Andrew Rossi, Page One, which follows life at the paper’s Media section (notably that of the very oddball journalist David Carr, a lovable curmudgeon) as it tracks the fall of several American newspapers, implements its own staff cuts and wonders whether the age of print is over. I know I criticize the NYT a lot on this blog, mostly for its coverage of Israel/Palestine, but this movie really makes you feel a tremendous amount of sympathy and respect for what newspapers like the NYT do. It’s true that it produces much great content (as well, as, unfortunately, Thomas Friedman columns) that is, for the most part, reliable. Where the NYT often fails is on areas that touch on the American establishment: foreign policy issues (Judy Miller and Iraq, etc.) and Israel, where the Jewish establishment (which the NYT is in some respects part of) imposes its skewed vision of events even as the rest of the paper claims to trumpet relatively liberal moral values. But all this is besides the point: Page One really makes you think about what might happen when there’s less NYTs out there and more Gawkers. I know what I’d rather read. Speaking of which, this month the NYT is finally introducing its paywall system. I don’t like how their model makes a difference between tablet and smartphone subscriptions (so if like me you have an iPhone and an iPad you have to pay $35 a month rather than $15 or $20 respectively) and am puzzled (if pleased) that they are making stories linked to by blogs available for free — it incentivizes blogger to link to them, as opposed to other publications behind full paywalls which readers find annoying when you to them on Twitter or blog posts. I really don’t see how people expect to get quality news reporting without paying for it. My problem is more than with a limited budget, I have to ask myself: WSJ, FT, or NYT? Frankly I prefer the first two in general. But I’m the type of person who generally finds the business press (and television news channel) much more useful, even though I’m not that interested in business per se. The other movie I saw, which was pretty good, was Dragonslayer, on skateboard counterculture in California. A very endearing film. It won two prizes at the festival.